There are two new collectible edition Montreal Canadiens magazines available at your favorite newsstand. 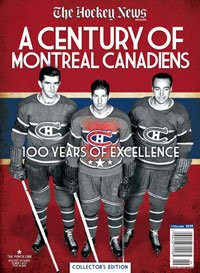 The Hockey News has released A Century Of Montreal Canadiens: 100 Years Of Excellence. It retails at $9.99 Cdn. The best part of this photographically spectacular 146 page publication is the 1-100 feature. THN takes look back at each of Montreal's 100 seasons, as well as numerous features corresponding to each number. It is a potpourri of fast facts, records, jersey numbers, and famous players. For all the action packed pages, there really is not a whole lot to the magazine besides of the great photo collection, to be honest. Outside of Ken Campbell's introductory 100 Years of Glory article and Brian Costello's back page story about Uncle Herb Gardiner, there is not enough of the usual feature content expected from Jason Kay's top notch crew. Feature content is not lacking here. In addition to new retrospective articles, Sports Illustrated's Adam Duerson went through the SI Vault and collected some great articles from the past. Hockey history, as it happened. Brilliant. The SI crew adds tons of photos, as well as decade by decade capsules of information. The best of the sidebar specials is the All-Era Teams, honoring the best players from each decade. The commemorative issue finishes with a nice one page piece written by none other than Jean Beliveau. The Habs' great writes about the team's special connection to Quebec, calling it the team's greatest legacy. This Sports Illustrated special is pretty pricey at 15 bucks, enough to make me balk initially. But after a thorough flipping-through, I quickly determined it was worth the price. 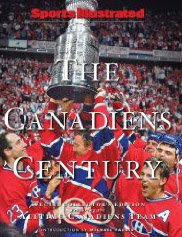 If 30 bucks (including various sales taxes) is too much for both magazines, I would definitely recommend buying Sports Illustrated's The Canadiens Century over THN's A Century of the Montreal Canadiens.